An aviation expert, Dr Yakubu Dazhia, has told a Lagos High Court in Igbosere that an aircraft flew “very close” to a Synagogue Church of All Nations (SCOAN) building soon before it collapsed on September 12, 2014, killing 116 people. Dazhia spoke during continuation of trial of four defendants – two engineers and their firms – for the building collapse deaths. The defendants are: Oladele Ogundeji and Akinbela Fatiregun charged alongside their companies – Hardrock Construction and Engineering Company and Jandy Trust Ltd.
At the resumed hearing of the matter on Friday 25thJanuary 2019, Dazhia was led in evidence by Olalekan Ojo, counsel for the Registered Trustees of SCOAN. 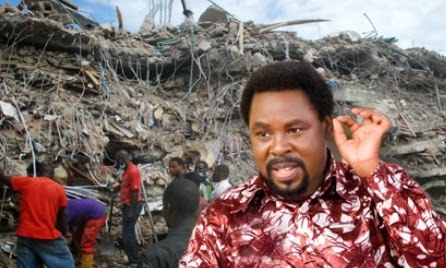 Dazhia, an elders’ council member of Winners Chapel but who worshipped at SCOAN whenever he visited Lagos in the last 10 years, said he was in Abuja when the building collapsed but that he flew to Lagos and the next day (September 13), alongside a Permanent Secretary in the Ministry of Aviation, and assisted in the operation to rescue people that were trapped. He also noted that he was not an aircraft traffic controller, a bomb expert or accident investigator. Following the conclusion of cross-examination, Justice Lawal-Akapo adjourned further proceedings till March.